Earlier in the year the Department for Communities released their proposals for redeveloping Crumlin Road, Carlisle Circus and Clifton Street. The plans are available here. The project’s introduction recognises the poor quality of the public realm, the severance caused by the hostile environment for pedestrians around Clifton Street’s junctions with the Westlink and Carrick Hill. The Westlink cuts neighbourhoods off from the city centre, and separates communities from economic opportunity. To the north and west of the Westlink lie some of Europe’s poorest neighbourhoods. To the south and east are some of Northern Ireland’s wealthiest districts. There is nothing bad about the context and background. It even mentions cycling without adding “foolhardy“. What does the Programme for Government say? In the absence of a Minister the civil service should continue the directives of the most recent Programme for Government. The Government have recognised that the share of 25% walking, cycling and use of public transport is stagnant and not sustainable. This percentage has to be much higher. It has remained roughly the same for much of the past decade. This is further fleshed out in the Department for Infrastructure’s Bicycle Strategy. All good. With such a framework in place we should expect something really good. A segregated cycleway of perhaps an even better standard than the Middlepath Cycleway. What is offered to pedestrians and cyclists in these plans? The green paint has all but been worn away, because drivers abuse it as a free car park for the nearby Mater hospital. It is effectively useless as a cycle lane. In the opposite direction there is a bus lane, which cyclists may use. Except, of course, for 22 hours of the day when it is a car park. It is effectively useless as cycle infrastructure. And ineffective as a bus lane also. The plans are for exactly the same. In summary, there are no plans for good quality accessible and safe cycle infrastructure on the Crumlin Road. The civil servant responsible will argue they were never going to build anything new there, because that particular road is not included in the Network Plan. So they don’t have to do anything at all. Except they do, under the terms of the Programme for Government Indicator 25, they have to build good quality, safe and accessible cycle infrastructure to give people the freedom and confidence to travel by bicycle to go to a hospital, say, or go into the city centre. Summing up, the cycle lane plans for Crumlin Road fail to meet the project’s targets, do not meet the requirement set out in Indicator 25 of the Programme for Government and least of all will persuade more people in North Belfast to cycle. In my blog about roundabouts I mentioned Carlisle Circus as a possible site for a Dutch-style roundabout with protection for cyclists and improved crossings for pedestrians. We await DfI’s plans eagerly, because the plans for this junction and the Carrick Hill junction are yet to finalised. Whatever it is, it has to enable pedestrians and cyclists to make their everyday journeys with freedom and confidence. A few questions, though. Why is there car parking on the circle itself? A roundabout with car parking. Mad. Almost as mad as a motorway roundabout with a footpath around it. Would that space not be better used to make the roundabout safer? Is there perhaps a lid on any radical change here? We can be pretty sure the final junction design will try and accommodate the big purple Glider buses. The BRT Gliders made an appearance in the Shaftesbury Square public realm plans, because phase 2 of the big purple bus will open up a north-south route across the city, with tentative plans for a route from Newtownabbey to Knockbracken, with a spur to Queen’s University Belfast. The exact route has not been settled yet, but space is reserved across the city nonetheless. What is the point, argue the civil servants at DfI, of making Carlisle Circus a place where people can walk and cycle with freedom and confidence now, when we will go and rip it up in a few years anyway? The Belfast City Deal includes the funding from central government for the North South BRT, which is conditional on the Assembly being restored. Readers, it may be a few years before the BRT comes anywhere near Carlisle Circus, if at all. In the meantime any developments that could benefit pedestrians and cyclists are stifled. Even when the BRT goes somewhere else, the resulting free road space is not automatically given to other sustainable travel modes. A little way along the Westlink the East West BRT was initially planned to go up Grosvenor Road. It was instead routed along the Falls Road a little north. The Belfast Cycle Network Plan RVH to Comber cycleway fizzles out at the junction of Durham Street and Grosvenor Road. An empty expanse of tarmac lies between there and the gates of the hospital. Cyclists are routed, diverted, along the polluted, noisy Westlink, where WHO air quality levels are breached on more than 25% of days of the year. And the gate from the Westlink to the RVH campus is closed at weekends. For an idea on how to improve Carlisle Circus for pedestrians and cyclists and include mass transit we -naturally- head off to the Netherlands. Mark Wagenbuur wrote about this roundabout in Amsterdam, the Hugo de Grootplein, which includes a tram track. And what is the BRT, but a tram without tracks? Dare the Department for Infrastructure build something mad like this? Maybe. They, after all, came up with a single lane motorway roundabout with a footpath. Clifton Street is a traffic sewer. It collects traffic from the Antrim and Crumlin Roads and dumps it in Belfast’s answer to Rome’s Cloaca Maxima, the Westlink. To continue with the scatological theme, the Westlink is part of the 1960s Belfast Urban Motorway (BUM, in case the penny drops more slowly for you). It is more than a road, an attempt to build barriers between rich and poor, Catholic and Protestant. Belfast is criss-crossed with euphemistically called Peace Lines. Instead these lines are the petrified remains of our conflict, uniting communities on both sides under the peace line’s dark shadow. The map of Belfast prior to the Westlink shows a dense network of streets and alleys. They were all cleared away and the residents moved to bright and breezy, optimistic sprawl and new towns at the edge of ever expanding outer urban Belfast. The Westlink is a formidable moat. And Clifton Street is one of the few bridges across it into central Belfast. The Clifton Gateway project recognises the severance, this barrier caused by too many vehicles in too little space, suffocating the life out of this area of town. Literally. Image showing air pollution in Belfast. Let’s see a before and after and see how pedestrians can walk with confidence and freedom from Carlisle Circus to Carrick Hill. A new bridge railing. That is it. No doubt more pleasing to the eye than the existing utilitarian fence. They plan to overcome a barrier to walking and cycling, a traffic bottleneck, with a fancy bridge railing. The plans acknowledge the existing footways are challenging, full of dips, bumps, kerbs and odd slopes. So walking might be made easier, but is it enough to encourage people to walk beside a noisy, smelly 5 lane traffic sewer, crossing flows of traffic to and from the Westlink; a journey currently undertaken by car? There is nothing for cyclists. There is an advisory cycle lane on Crumlin Road, but where it is needed most, at Carlisle Circus and along Clifton Street there is nothing. The plans maintain 5(!) lanes for motor traffic. There are no bus lanes, not even for the BRT. Belfast is not going to achieve its aim to reduce greenhouse gas emissions and air pollution targets if the government like a gambling addict keeps backing the losing horse, or in this case the car. If we want road space for cyclists and buses space needs to be taken from one or more general traffic lanes. Happily, Clifton Street has plenty of room for bus lanes, cycleways, leaving 2 lanes of general traffic. This opens up a whole new realm of possibilities. The junction with the Westlink pulls traffic from across North Belfast towards it. It increases traffic on surrounding roads; much the same way the Stranmillis gyratory pulls traffic towards itself. Down below, on the Westlink, the weaving of traffic to access the Clifton Street slip roads, or of traffic joining the Westlink, reduces speed and capacity, reduces traffic flow. Be radical! Remove the slip roads, remove the central filter lane on Clifton Street, do away with the traffic lights. Do away with the junction. Fewer drivers will come to Clifton Street, because they can no longer access the Westlink there. Which is good, because you have just given all that space to buses, cyclists and pedestrians. The drivers will soon discover that they can still access the strategic road network at Fortwilliam, York Street and Divis Street. The Carrick Hill junction is a mess, 5 roads converge on the junction. It is a challenge for any cyclist or pedestrian to cross safely. There are filter lanes inviting drivers to cut across cyclists going straight ahead. One is at Donegall Street entering Carrick Hill, the other on Carrick Hill, entering Clifton Street. There is no need for filter lanes in inner urban areas. Filter lanes, advanced stop lines, pedestrian guard rails and staggered crossings (all found on this junction) have little to do with safety, but everything to do with improving car traffic flow. They are symptoms of car-centred road design, obsessed with moving cars. This should be a place where people using public transport, people walking and people cycling dominate. A proposed Belfast Cycle Network route crosses the junction, from Carrick Hill to North Queen Street. Instead of a space for people, we have dreadful wasteland of tarmac. A road diet is long overdue for this morbidly obese junction. If you arrive at this junction by car your destination should be nearby in the city centre. If your destination is elsewhere the light sequence and road layout should quickly send you back to the nearest Westlink access at York Street. Thank you, if you have made it this far. If you are a cyclist, the worst of the traffic is now behind you. Currently, Donegall Street is a tired looking, inner city street. However, change is coming to this corner of Belfast where the University of Ulster are building their new city centre campus. The whole area is overseen by cranes, new high rise university buildings and student residential blocks. The plans are to maintain what is there, but improve the pavement surface. The plans for Donegall Street should reflect the population shift in the area. More walking, enabling cycling, public transport as the street’s main user. A bit like so, perhaps? Donegall Street (featuring a 6.5m wide footway!) is wider than Nobelstraat in Utrecht, so most of the car parking could be maintained, to protect cyclists on the cycleway from passing vehicles. The Transport for Greater Manchester design guide provides a helpful diagram for a hybrid (terrace) cycle track. Like the Shaftesbury Square plan, the proposed changes do not amount to much change at all and will certainly fail to lift the number of people walking and cycling in North Belfast. The plans do not reduce car traffic or road space for cars, and do not give space for cycling and public transport. The plans are a beauty makeover for a traffic sewer; it will remain a traffic sewer. It is a traffic sewer repackaged. We have a very short time to radically change our city and the way we move around it in order to save the planet from the worst effects of climate change. These plans are deeply disappointing for those looking to improve air quality and improve health outcomes of the communities beside these roads. The best thing the responsible government departments can do is to rip up these plans and start again. Imagine a new Belfast, where people are put first, not just those privileged enough to own and drive a private car. Indeed. What price is a child’s life? People list incidents, collisions, some resulting in damage to property. And Department for Infrastructure refuse to act. A petition will not achieve much either. A petition with 1500 signatures calling for the pedestrianisation of Hill Street, supported by politicians of every hue and local businesses was airily dismissed by DfI. And unless someone dies in Greystown, the residents’ petition is equally doomed to fail. Greystown Park is a road that links Finaghy Road South to Upper Malone Road. It is a residential road, but as so many residential roads in Belfast is used as an alternative to avoid queuing traffic at the top of Finaghy Road South and bypassing some of the morning rush hour congestion on Upper Malone Road. Greystown Close is a cul-de-sac off Greystown Park. Greystown Avenue is a residential cul-de-sac, off Greystown Park, but it also links to Finaghy Road South with a footpath. The residents want to see traffic calming, i.e. speed bumps, but other voices question their usefulness in reducing traffic volume or speed. At nearby Diamond Gardens in Finaghy speed bumps fail to deter the number of drivers choosing residential streets in order to avoid the chronic congestion at Finaghy crossroads. Speeding remains an issue. At Strangford Avenue traffic speeds are not noticeably lower despite speed bumps, because the road environment in between encourages driving at 30mph. The two streets require different solutions to their problem. Northern Ireland Water carried out work that blocked off the entrance to Upper Malone Road. Traffic for the entire neighbourhood was rerouted through the Finaghy Road South entrance. Traffic volume was notably lighter in the morning rush hour as rat running drivers were forced to use the main road instead. Greystown Park can be severed for motor vehicles just above the junction with Greystown Close. Pedestrian and cyclist access can be maintained, but rat-running will be prevented. The question is whether residents are willing to give up the minor convenience of having two access points for their neighbourhood to stop the major inconvenience of rat running and careless driving? Through decades of car-centred road design and planning, coupled with conditioning from manufacturers, Belfast residents have come to think of cars as their only or preferred mode of transport. Any measures to reduce the negative impact of motoring are framed as reduction of personal freedoms in the local media. The key to introducing traffic control measures is getting community input and ownership. Sadly, we live in NI, where we are administered by faceless bureaucrats who operate without much oversight from our politicians. Attempts to address any issues on and surrounding our roads are routinely stonewalled by the Department for Infrastructure. Greystown Avenue is a cul-de-sac, so a 20mph or even 15mph speed limit, enforced by placement of planters, installing speed tables and chicanes will result in a much safer environment for children to play. 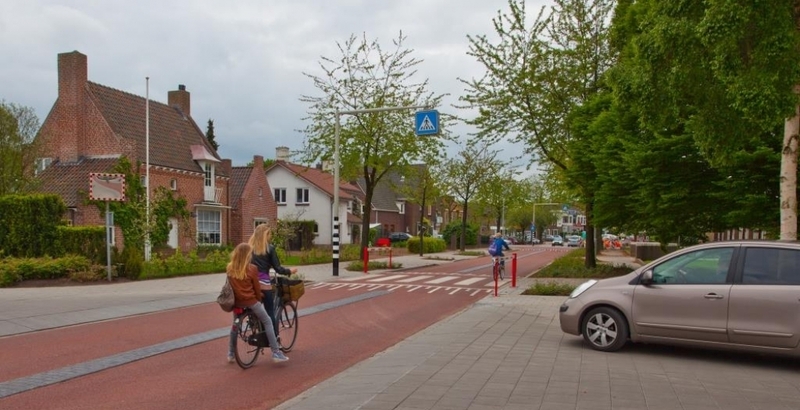 Another example here in Houten, near Utrecht, where, despite completely prioritising pedestrian and cycle traffic, residents can easily access their house by car. Inspired by the plunger bike lanes in the US, residents could take matters into their own hand and improve their street. One tactic that could work locally is for residents to park on alternate sides of the street to create chicanes, forcing traffic to slow down. It wouldn’t take much organising. You see your neighbour’s car as you drive up, so you park on the opposite side. The only agreement you need is for people to park their cars at the kerb, rather than on the drive. These could be developed by a residents’ committee as a community play area, seating with views over Belfast, or simply to meet and chat with neighbours. They are temporary, but could, if successful, easily be converted to permanent features. 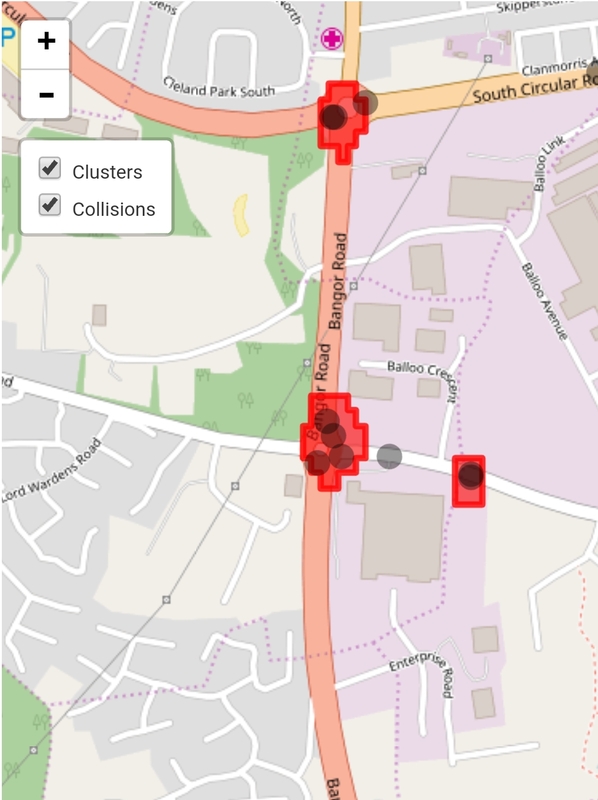 In the meantime, residents need to organise; to log every traffic incident (however minor) and report them to the PSNI. They need to build a case for converting their street to a safer area for all to enjoy. They need to think creatively and approach political representatives as a collective. And they need to come up with creative and eye-catching ways to alert local media to their cause. Go to Write to Them and put in your postcode. This should list your councillors, MLAs and MP. Write to any or all of them. that the Minister did so after meeting taxi company representatives where no minutes were taken, or DfI officials attended. Highly questionable, I am sure you will agree. Such DfI experiments have a habit of becoming permanent. Indeed, the consultation document gives no time scale at all. The tidal parking restrictions in South Belfast started as a 6-month trial. And was made permanent after no objections were received from stakeholders, or rather, ignoring cyclists’ numerous objections. On Stephen Nolan this week it was revealed the Department sees the consultation as a tick box exercise, and is determined to proceed regardless of the Consultation outcome. Indeed, a contract in relation to this “experiment” has already been awarded. I ask you, please, as my elected representatives to add your voice to my objection to this sordid piece of sleight of hand and ensure that the proper procedure is followed and the Department for Infrastructure is held to account. I wrote about North Down’s poor road cycling safety record before. Summarising, 3 people out cycling were killed within one year, 2 on the same road. In my blog I presented a not very ambitious plan to improve safety for bicycle users along the A21. Unsurprisingly, nothing has changed, other than the roll-out of the award-winning PSNI See The Cyclist campaign to North Down. In the meantime 2 of the 3 drivers have appeared before court, both pleading guilty to the charge of causing death by careless driving. The sentencing of Lindsey Huddleston, who killed David Catherwood on the A2, was not reported. We now have more information on how father of five Stephen Lynch died. Mr Lynch was struck from behind at 50mph by Mr Lappin, driving a Renault Scenic, who failed to notice Mr Lynch ahead of him. Mr Lappin escapes jail, for which he would have got a maximum of 3 months and be out in 6 weeks. Instead he is to serve 100 hours community service. No, really, read the reports: he blew his nose and someone died. So far a lot of the focus has been on the lack of a rear light on Mr Lynch’s bike. Or that he was not wearing high visibility gear. But then, if Mr Lappin was not otherwise engaged, he may have spotted the cyclist on the straight and well-lit road. More likely, even if Mr Lynch had road legal lights and had a form of high visibility gear, Mr Lappin would still have gone into the back of him because Mr Lappin had his eyes closed. You try blowing your nose without closing your eyes. How can such a small lapse, such a small natural action, blowing one’s nose, lead to the death of another road user? It shouldn’t. Can we learn anything, make changes, and prevent this happening again? There are precious few alternatives to the route Mr Lynch took between Newtownards and Bangor. All of these are dominated by cars and lack any kind of cycle infrastructure. In my previous post (linked at the start) I offer an idea what could be done quickly enough. And two fatalities should provide the incentive to put together a meaningful package of route improvements. From the reports it becomes clear that Mr Lappin was travelling at 50mph, well within the 70mph limit. Also Mr Lynch was travelling at 10 to 20mph in the same direction, meaning the closing speed was between 30 and 40mph. The probability of surviving a collision at these speeds lies between 10 and 50%. What this says is simply, a driver and cyclist should not be sharing any roads with a speed limit greater than 30mph. Whilst blowing one’s nose appears to be a very uncommon cause of accidents, coughing and sneezing behind the wheel does appear to cause a significant number of collisions, once source calculates as many as 2500 collisions a week in the UK. Google failed to find me any instances of an incident caused by nose blowing other than the present case. A number of drivers have been fined for blowing their nose whilst driving. And quite right too. Forgiveness – that no one should die as a result of an error by themselves or another road user. You could think of installing rumble strips to alert inattentive drivers when they veer off course, or deflecting kerbs to ensure cars are pushed back into the road when the driver errs. Also, a soft verge could make the difference between a life and death. In contrast to the Dutch, British and Irish authorities have a curative response to road safety. Something happens and they respond on that location, sometimes. Incidents or accident black spots are seen and dealt with in isolation. A spate of collisions at the petrol station nearest to our home led to the speed limit being dropped from 50 to 40mph. A drop in the speed limit is to mitigate the consequence of a collision. It does not necessarily prevent future collisions happening. Ideally, after any severe collision there should be an audit of all other similar locations across the country. Has there been an audit in Northern Ireland of all petrol station entrances and exits on 50mph roads in built up areas in Northern Ireland? Probably not. In the rail or air transport sectors such industry-wide reviews are a matter of course. When a fault is reported entire fleets of aircraft are grounded and checked. This safety culture has meant that in 2017 no large passenger aircraft crashed at all, anywhere in the world. If a dangerous roundabout is fixed with a new design or layout, that should be applied on all similar roundabouts. And new roundabouts must not be built including the same old faulty design. More than that, Sustainable Safety should become part of UK and Irish road designers’ thinking so a route between, for instance, Newtownards and Bangor can be safely walked, cycled and driven. I will not waste many words on the judge’s comments which boil down to if you kill a cyclist, it is just one of those things. Deplorable. None of this will help Mr Lynch’s family and friends now. We should also extend our sympathy to Mr Lappin. Few of us know the anguish and guilt he must endure for inadvertently taking someone else’s life. Once again the weather forecasters are giving us weather warning overload as a band of icy, snowy and windy weather promises to paralyze our little corner of the world. This winter has seen a couple of spells of icy weather. And the Department for Infrastructure is stepping up to the challenge. I don’t give up cycling easily. The last time I stopped commuting was in 2010, when temperatures dipped so much below freezing gritting stopped being effective. Streets were transformed into ice rinks. Even main roads like A55 Balmoral Avenue more resembled an Olympic bobsleigh track than part of Belfast’s main orbital route. The worst, sustained spell of poor weather since 2010 brought almost a week of snow, sleet and icy roads to the Belfast area in mid and late December 2017. Cycling on the pavements and down quiet roads on the freshly fallen snow was fine. The ground underneath had not yet frozen, so our big bike easily sank through the slush and the big wheels gripped solidly onto tarmac. The main carriageways however were soon rendered impassable: countless cars compacting the slushy snow into solid ice. It took a couple of days of sustained gritting to clear main routes. By contrast, by the second day the pavements were now treacherous. Pavements are only gritted by accident when the road beside it gets treated. On the school run I faced the horrible dilemma of sharing a main 50mph road with 1000s of vehicles or take my chance on the pavement. I took my chance; I lost and skidded on a particularly sneaky patch of black ice on the pavement. No harm was done and we continued on our way. Happily, by the evening the same path was ice free and dry and I got home safely. In Belfast only a few paths are gritted, all shared use and as far as I can tell all managed by the Department for Communities. Hi Ivor, our gritting contractor has assured us that the pathway at this location was gritted last night, however it is possible that insufficient salt was used. We have instructed them that additional salt be used from now on. As far as I know, neither Belfast City Council or the Department for Infrastructure grit paths in their care. So the Lagan Towpath at the Gasworks was gritted, but not in Clement Wilson Park or Lagan Meadows looked after by Belfast City Council and Lagan Valley Regional Park, respectively. Please use the comments below if you know differently. Though, saying that, someone spread salt around Old Shaw’s Bridge and the footpaths at the junction of the Ballylesson Road and the A55 Milltown Road with what looked like a manually operated gritter. Who did it? Whoever you were, a big thank you and well done! I asked the Department for Infrastructure in km how many cycle paths in Belfast City Council area, designated or shared use, are scheduled to be gritted when a weather warning is issued. I asked the Department for Infrastructure if they possessed vehicles designed or suited to clearing snow and ice from cycle paths. So tonight, as I write this, the Department’s gritters are out salting the main traffic car routes, but leaving everyone else, pedestrians and cyclists with near impossible journeys. In East Belfast cyclists are expected to use the Comber Greenway instead of the Newtownards Road. The road is gritted, but the path is neither lit, or cleared of snow and ice. In the heart of winter cycling stops for all but the bravest. The Department for Infrastructure evidently still treat cycling as a leisure pursuit that is abandoned in winter, not as a viable alternative to our driving on our traffic-choked roads. In Copenhagen -like Den Bosch- they set their priorities differently. The Police Service NI rolled out its version of West Midland Police close passing initiative in the summer of 2017. The initiative was also shared on Facebook. The initiative was extended from Belfast to Bangor and Ards, perhaps in response to Gavin Moore’s death on the A21 near Bangor. The #seethecyclist campaign is headed by the force’s neighbourhood policing teams. The main focus is on driver and cyclist education. What has been missing from the news headlines is how many drivers have been spoken to about their driving about cyclists. West Midlands Police have been very vocal in sharing their success, reducing serious cycling KSI (killed and seriously injured) by a fifth. Belfast local media picked up the start of the PSNI campaign announcement, which was criticised by local cycling campaigners for focusing on cyclist visibility, rather than driver behaviour. However, drivers have been educated. The lack of news in main stream media about campaign successes was worrying. Has the campaign actually been followed through and are officers on the street catching careless and dangerous drivers? An FoI request revealed that in Belfast and Bangor and Ards districts a total of 39 and 8 drivers respectively were offered advice about their driving. Additionally 250 information packs were handed out to cyclists. PSNI is to be commended for adopting See the Cyclist as a strategy to reduce cycling KSI. Their work with cycling clubs is very good and should give the PSNI a shout at lifting a Fred Award later this year. However, they can do more. The lack of prosecutions is worrying. If the campaign is not backed up by punishing poor driving behaviour drivers will not change. You have to question the impact on drivers if all they have to sit through is a word of advice. Also, the scheme’s successes need to be shared more widely. At present See the Cyclist is buried in the Facebook feed of neighbourhood policing teams. It needs to start hitting the headlines. Three years ago I blogged on the consultation for the redevelopment of Shaftesbury Square, launched by the then Department of Social Development, now Department for Communities. The plans mentioned the poor provision for cyclists travelling across the Square from North to South. It did not mention cyclists being unable to cross the Square from Donegall Road to Donegall Pass. No mention either of the Belfast Bikes hire stations in Botanic Avenue or Bradbury Place. My blog post was picked up by the design company, GM Design Associates. My comments would be passed on to Billy Robinson, the project lead, who is a “keen cyclist”. You then think in the intervening years, with Belfast Bikes establishing themselves into the streetscape, 2 Ciclovia events, increasing numbers of people on bikes crossing the Square daily for commuting, shopping or leisure, the plans under the aegis of a keen cyclist would move away from providing for cars to something more pleasing, more people friendly, more human scale. The words remain good, though I have to take issue with the insertion of “most foolhardy” in the description of cyclists who currently use the Square. How exceptionally hostile and hazardous is it? 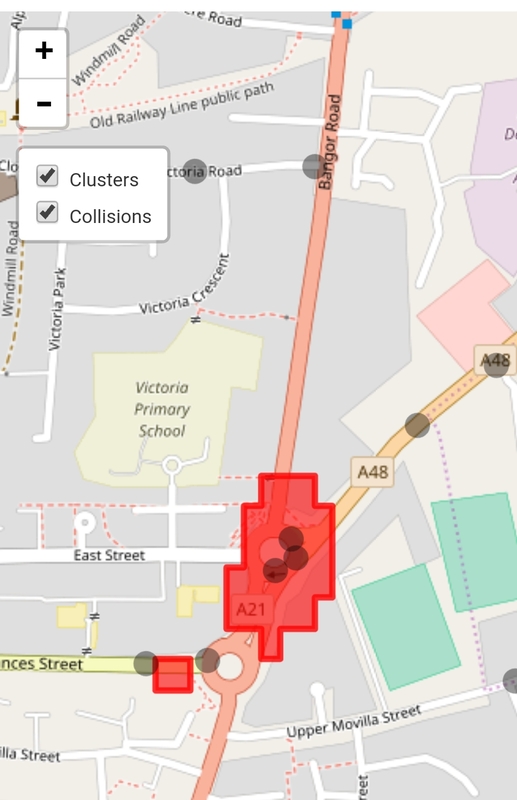 Mapped are all collisions involving cyclists between 1998 and 2015. This reveals that lower Botanic Ave, site of the Belfast Bikes hire station, is a very hazardous place. The plans would only address the latter, as the plans are summarised best as the removal of the Botanic Avenue slip lane to make a larger public space. At the end of my blog I scribbled a plan of how the plans could be improved. I was still maintaining the Great Victoria Street and Dublin Road gyratory. We now have had 2 Ciclovia events, showing the potential benefit of pedestrianising Botanic Avenue and Dublin Road, and the excellent route Dublin Road would make as the primary access into the heart of Belfast, continuing along Bedford Street. Over the years Belfast’s Golden Mile along Great Victoria Street has withered and is now only found in people’s memories and sepia tinted photographs. However, a lot of nightlife, pubs, restaurants and cafés are now along the axis of Dublin Road, Botanic Avenue and Bradbury Place. The Department for Communities plans should look beyond the Square and move through traffic away from Dublin Road and Botanic Avenue. Removing through traffic from Dublin Road will result in Great Victoria Street becoming two way, with a much simplified junction with Donegall Pass and Donegall Road. If Botanic Avenue were pedestrianised the junction would be far simpler still. Great Victoria Street has ample space to accommodate 2 bus lanes, 2 general traffic lanes and cycle paths. If the Department for Infrastructure can give up its obsession with on-street parking. The biggest problem with the Department’s plans is turning Shaftesbury Square into a shared space. This would require a massive reduction in traffic volume. The plans only mention a reduction in vehicle speed. So let’s see how this has been translated into the plan. No dedicated cycle route through the Square. No bus stop bypasses. A shared space, where up to 3000 vehicles an hour cars jostle for room to move. More car parking is included in an area where there is already no shortage of spaces. This is not going to improve the place for pedestrians or cyclists. People with impaired vision or mobility will struggle to move safely across a space without clearly demarcated spaces for vehicles, pedestrians and cyclists. It is not as if this idea has not been tried before. And failed. It was nominated for a prize. Mortifying. Closer to home, in Lisburn, Joanna Toner won a court case over the use of low kerbs in the town centre shared space development. “[Joanna] stated that previously she could walk around Lisburn city centre without difficulty, accompanied by her guide dog or using a white cane.” But no longer. The shared space has destroyed her independence and confidence. Lord Holmes called for a moratorium on shared space schemes. With the large volume of traffic on Shaftesbury Square the definition of shared space is pushed beyond its limit. LTN 1-11 (link above) talks of a threshold of 100 vehicle movements an hour at which point the space becomes a road to be crossed, rather than a truly shared space. None of the arms of Shaftesbury Square are anywhere near that figure. Donegall Pass with 400 vehicle movements is the least busy but still 4 times the threshold. In the GM Design plan the roads will remain roads to be crossed, and pedestrians will remain pushed to the edges of the Square, near the buildings. How does a blind person negotiate with 50 vehicles a minute in crossing the Square? How will an 8 year old cycle safely across this space with around 70 buses per hour? Traffic volume needs to be reduced dramatically before we start dreaming of turning Shaftesbury Square into a space for events. Simply putting a 20mph speed limit sign up and putting down nice slabs of stone is not going to achieve very much. Haarlemmerplein, Amsterdam. Mark Wagenbuur did a little portrait of Haarlemmerplein in Amsterdam. Its redevelopment was controversial, with the design changing from a historically inaccurate pond to a water feature similar to the one at Belfast Custom House Square. The take home message there is the rerouting of the main flow of traffic away from Haarlemmerdijk, across the square to Haarlemmer Houttuinen, just to the north. Removing the main flow of traffic enabled a more human scale square. Somewhere to chat and to spend time and money. Similarly, Times Square, New York. Snøhetta, the designers, boldly pedestrianised Broadway between 42nd and 47th Street, removing a flow of traffic across Times Square. The Department for Communities was inspired by Times Square, but GM Design Associates were not bold enough to remove any traffic flows across Shaftesbury Square. Noise pollution is a serious problem in Shaftesbury Square. The dark blue splodge on the map above is where average daytime noise levels exceed 75dB. This is uncomfortably loud. People have to shout to make themselves heard. One of the startling features of Dutch rush hours and cities is the lack of road noise. Staying in a B&B just off Amsterdam’s Vijzelgracht, the only clue that rush hour was in full swing was the ringing of tram bells and the sound of people chatting as they rode by on their bikes. A street café is unimaginable in Shaftesbury Square unless road noise is reduced. Electric cars will reduce engine noise, but the equally noisy rumble of tyre noise and wind resistance remains. These are NOx-emissions apportioned per vehicle type. We can now add that cars (especially diesels) are now known to be far more polluting than thought when Belfast City Council drew up its Air Quality Action Plan. Without drastic action Belfast air quality will fail to improve and annually 300 people will still die prematurely because of air pollution caused by traffic. With these plans pedestrians and cyclists on Shaftesbury Square will continue to breathe in noxious fumes because no effort has been made to reduce through traffic. I am all for Rapid Transit. What I question about its implementation in Belfast is it being introduced without taking space from cars and removing space for cycle paths. In the consultation the Department for Infrastructure glibly dismissed cyclists’ concerns. I queried this with the Department and was told cyclists could use the bus lanes. As pointed out in the BRT consultation responses. And that was it. The Department for Infrastructure Cycling Unit shrugged its shoulders and Sustrans was happy with that. In East Belfast a dogged campaign saved the Comber Greenway from being turned into a fast bus track. The route was put on the main Newtownards Road. Cyclists can use the parallel Comber Greenway. In West Belfast the BRT goes up the Falls Road, Andersonstown Road and terminates on the Stewartstown Road. No alternative cycle route is available, though the Department for Infrastructure insists cyclists can use the paths through Bog Meadows instead. That is perhaps fine for fit people on conventional bicycles, but everyone else will struggle. The plan’s transport goals have the BRT at the apex of Belfast’s transport hierarchy. The plans do not remove general traffic lanes to accommodate the dedicated bus lanes. And in the plans, despite having dedicated cycle tracks as a transport goal, no dedicated cycle tracks are included. Unless GM Design Associates Billy Robinson, the foolhardy keen cyclist, doesn’t mind sharing with buses. And thinks a bus lane is a cycle lane. I get tired trotting out this graph from Sustrans Belfast Bike Life report. Bus lanes you can cycle in are the least encouraging for getting more people to cycle. Times Square, New York, shows how we can improve the presented plans. Dublin Road and Botanic Avenue need to be pedestrianised, with a two way cycle track along the entire length. Donegall Pass is dead-ended for vehicle traffic at its junction with Botanic Avenue. Great Victoria Street becomes two way from Bruce Street to Bradbury Place. Great Victoria Street will have inward and outbound bus lanes, a general traffic lane in each direction and cycle tracks. The bus lanes and cycle tracks are continued up Bradbury Place. The cycle tracks flow behind the bus stops. On-street parking is removed entirely, leaving a only couple of loading bays and a taxi rank. In Leiden at the Lammermarkt an underground car park was built, leaving space on the surface for events. If Belfast were really ambitious it could do something similar. It has to be balanced by removing more surface parking in the city centre, so encouraging drivers not to take cars into the city centre. Geraldine McAteer, the Sinn Fein councillor for Balmoral invited people to attend a Belfast City Council consultation on replacing the green steel barriers on Finaghy Road North railway bridge. I went along to see what was planned. Would it address any of the problems around Finaghy Road North: the rush hour congestion; the lack of cycle infrastructure; the poor access to Finaghy railway halt; the dangerous junctions of Finaghy Road North with Diamond Gardens and Orchardville Avenue. There was a choice of cladding for the bridge sides, paving slabs or tarmac and lighting options. Early in the day people expressed a clear preference for sides that allowed people to see the trains, and didn’t offer a blank canvas to graffiti “artists”. Also, people wished to have the bridge reinforced with a containment kerb and rail. This is understandable. The local environment, with a high traffic volume is threatening. One, unintended, consequence of a containment kerb and rail is the narrowing of footpath space. Some of the path width will be recouped from removing the green barrier. Narrowing will be bad for pedestrians and cyclists. The road itself is very narrow and doesn’t allow cyclists easy filtering past the queue of traffic. Most cyclists will continue to use the footpath, but with less space, more conflict seems inevitable. After the Great Heck Rail Crash in 2001 railway bridges across the UK were assessed for safety. The crash near Selby was caused by a sleep deprived driver plunging his Land Rover and trailer, loaded with a Renault 21, off the M62 onto the East Coast Main Line. The southbound early morning Intercity service from Newcastle to King’s Cross hit the Land Rover and was pushed into the path of a freight train travelling in the opposite direction. 10 people died and 82 were injured. The bridge at Finaghy was identified as in need of most upgrading in Northern Ireland. Very soon after the “upgrade” local politicians called for the “ugliest bridge in Ireland” to be improved. We can only hope the current consultation is the beginning of the end for the green walls of Finaghy. There is no budget for major, meaningful improvements. The current consultation is simply looking at replacing the green containment wall with a prettier arrangement. No plans exist to making the bridge safe for cycling. Many cyclists choose the footpath rather than go on the road. The bridge approaches and nearby junctions are outside the project’s remit. The footpath is not much better; the area is blighted with pavement parking and dog dirt. @newbelfast @PaulaJaneB my children walk to Finaghy to school. Between the traffic lights and the bridge it's ridiculous. Finaghy Road North is used by through traffic; it is a favoured route for taxi drivers to and from Belfast International Airport to south and east Belfast. This part of Belfast does not see much cycling. The 2011 Census shows the share for cycling at around 1% – about Northern Ireland average, but below areas to the northeast, closer to the city centre. Few children cycle to school; the majority of primary school age children are brought by car. And all because the car is given priority. Any solutions for this bridge should put the interests of pedestrians, cyclists and public transport above that of car drivers. With BRT coming to the northern end of Finaghy Road North, more should be done to dissuade residents in the area reaching for their car keys when they need to go out. Stopping rat running and inappropriate through traffic will increase road safety in the area, which will enable people to walk to the train or bus, to work and school. Incentives need to be offered to residents to discover for themselves how good and convenient public transport or cycling can be for them. Most people reach for their car keys, because the other options are simply not familiar to them. The Belfast Bicycle Network Plan reaches Finaghy Road North by way of the private school grounds belonging to Malone College and Cranmore Integrated Primary School (red on the map below). Which is strange, because the school gates close when the last member of staff leaves in the afternoon. During the day visitors to the grounds using the back gate at Musgrave Park are buzzed in. A better solution here is to take the network cycle path along the railway straight to the station (green on the map below). The railway embankment and grounds are wide enough to accommodate a path. I suspect at some stage there were sidings here. Finaghy Road should have cycle tracks running its entire length. It would enable more pupils cycling to school. The principal of Cranmore IPS welcomes more pupils coming to school on foot or by bike, but the road environment simply makes it impossible. A solution for the look of the bridge should be sufficiently flexible to allow for the construction of cycle tracks at a later date. What is amazing is that the bridge over the railway never had a footpath on both sides, as this view of Finaghy Lane in the 1930s shows. However there was an access to the railway down a set of stairs on the south side. It appears the land immediately below and beside the bridge is still owned by Translink and gives access to the station forecourt via an arch. Why can this lane off Ardmore Avenue not be used for vehicle access to the station, rather than crossing the pub car park? Warning from 1pm is not helpful -signs at finaghy station were not present upon alighting train this morning. Soaked and furious. The station is currently reached by steps from the road level down to the platforms. For people using mobility aids, prams and bicycles there is a detour to a ground level path leading to the southbound platform and the halt’s forecourt. Not having a footpath on both sides of this urban distributor road is not acceptable; it discriminates against those who have difficulty crossing roads. The lack of a footpath adds to the bridge being perceived as a barrier. Simply because a footpath was not there in the 1930s is not a good enough reason to not have it there 80 years later. The area has changed beyond recognition. Pedestrian walkways can be added to each side of the bridge with ramps leading straight down to platform level on both sides of the road and railway line. The replacement of the ugly green barriers is long overdue. It detracts from the area and makes the walking and cycling environment even more hostile. Narrowing the footpath to install containment kerbs will increase conflict between pedestrians and cyclists. None of the areas traffic problems are addressed and no budget is available to put pedestrians, cyclists and public transport first. We spent our summer holiday in Mayo, just north of Newport. The Great Western Greenway runs a short distance from the holiday home. We were separated from it by the busy N59. The Great Western Greenway deserves to be copied by county councils across Ireland, but it should not be a simple case of copy and paste. It can be improved. However. A big however. A railway is designed not to interact with local roads. It threads its way through the landscape separate from the grid of roads and streets. The landscape of Ireland is littered with arches and tunnels, taking railways over and under rivers, roads and hills. This creates separation between the Greenway and the land it passes through. The consequence is that people will cycle the Greenway end to end, but not interact much with the area in between. Mayo County Council has tried to overcome this by introducing short loops on local (restricted access) roads to encourage people to visit sights and places of interest within a short distance from the Greenway. These loops are signposted and well worth their while. The obvious jumping off point for these loops are former level crossings, or where farmers created access tracks to the fields using the old railway bed. Some of these loops cross the N59, or require people to walk or cycle a short distance along the 100km/h main road. A road with no pavement or cycle paths. The only safe way for us to cross was to put our 10 year old on the back and her bike on the front of my bike. Not everyone has the bike to do that. It is not sufficient to create a Greenway and not do anything about the main roads in the vicinity. These need to be designed so an 8 year old or and 80 year old can make it across safely. On Twitter I have had an exchange with a Maghery resident about a proposal to put a walking and cycling bridge across the Bann near its mouth with Lough Neagh. They fear that the building of a bridge will increase vandalism, spoil scenery and bring hordes of tourists to peek into their houses. So far so “Not in my back yard”. Greenway planners need to get resident buy in by clearly setting out Greenway benefit to them. They need resident involvement in design process, and allow a meaningful consultation. Many development schemes get mired in reviews and court cases, resulting in delays, simply because the consultation process was not used to give local residents a proper voice. Sometimes residents have a point about not wanting a Greenway on their land. At Derradda on the Newport to Mulranny section the Greenway takes an unexpected detour. It first veers off the embankment, then follows local access roads, returning to the original line via a newly built path. The red line in the map above goes through a homeowner’s garden. The homeowner’s objections can be understood. Not every one wants a public path yards from their property. What it also shows is that for Greenway building authorities need not gain 100% landowner buy in. Adjacent roads can be used, if cyclists can be safely given space there. It also means a Greenway can be built, before all landowners are on board with the idea. Seeing it in practice, showing the economic potential realised, might persuade people to allow access at a later date. In many cases local roads near the old railway line only serve to give access to properties and fields. Realistically, roads will need to be used because the railway land was in many cases sold off. This is especially the case in towns. The Midland and Great Western Railway ceased operations relatively recently. The last train trundled along the line in 1970. Just north of Newport town the railway was completely dismantled, and the N59 was partly realigned and is now where the railway was. At Burrishoole the present N59 bridges the sea inlet to the tidal Furnace Lough where the railway used to be. The old road now serves as the Greenway. I’m not entirely persuaded that the strip of paint will keep my family safe from an errant driver on this 80km/h road. On the edge of Newport the railway line crossed the Mulranny road. Only the remnant of the arch stands today opposite Kelly’s car dealer’s. The railway line itself was built on. A small house stands where the platform of Newport station ended. The station’s goods store is a place of worship. It is easy to miss the entrance to the Greenway, which is situated at the corner of a gravel layby. Homemade signs direct cyclists to the path. Despite this local initiative bicycle users can be seen riding the main road beyond. Mayo County Council could do more to make the path entrance more obvious. Most cyclists use the pavement between the end of the Greenway and the town centre. There is no cycle infrastructure at all in Newport itself. The Greenway continues towards Westport beyond the town; again cyclists use the pavement to bridge the gap between the Greenway and the town. It seems that Mayo County Council values car parking more than providing a safe, continuous cycle path through Newport town centre. With the acres of tarmac available on either side of the Newport River bridge more can be done. The old railway bridge is not easily accessible for cycling, with stepped access. An odd arrangement, because it is the obvious alternative crossing point to the road bridge a little further downstream. The railway line used to go through two tunnels south of Newport. I guess it was too costly to restore these and run the Greenway through them. The Comber Greenway similarly ends at the edge of Comber town where the A22 has taken the place of the old Belfast & County Down Railway line. Cyclists have to use the Old Belfast Road and narrow, congested Castle Street and Mill Street to reach Comber town square. A better solution in Comber is to route all motorised vehicles coming from Dundonald and the Glen Road (via Glen Link) down the A22 to the Killinchy Street roundabout. Make Railway Street one way Dundonald bound from Lime Grove to reduce rat-running. Block off the Old Belfast Road junction with the A22 and make the route from there to Comber town square a cycle priority street, banning access to motor vehicles at the A22 viaduct. Removing through traffic from Castle Street and Mill Street will enhance the shopping experience; currently shoppers have very little room, with pavements barely wide enough for a pram. Castle Street could see motor vehicles removed entirely, with access maintained through Bridge Street Link. It is for the people and traders of Newport and Comber to decide whether to bring the Greenway and its many users into the town centre safely, or continue to live with streets completely dominated by motor vehicles. 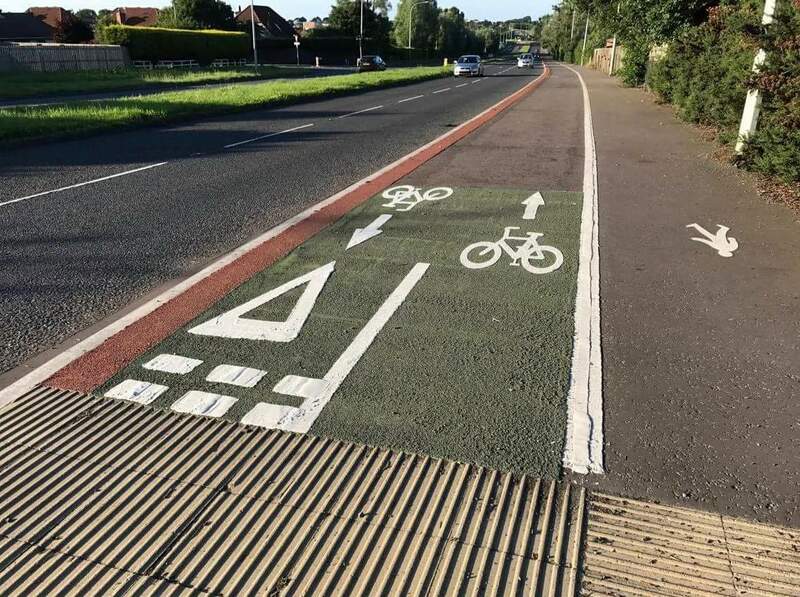 Michelle McIlveen as Transport minister had great ambition for the Comber Greenway to be a Cycle Superhighway, but how can it be a fully developed transport link if cyclists are abandoned at the edge of town? The Great Western Greenway is a good template for Greenways across Ireland. The benefits are clear, adding millions to the local economy. From Waterford to Sligo, Leitrim and North Counties old railways are being transformed. More thought should be given to drawing the Greenway into town centres. Simply painting a line on a road and sticking a bicycle motif down will not do. Such as this example from Westport. In Northern Ireland proposals and plans for hundreds of kilometres of Greenways are in development. The lack of an Executive should not hold up local planning and design proposals. However, some day soon a Minister will have to allocate budget to these plans and allow these paths to be built. I dedicate this post to David Catherwood, Stevie Lynch and Gavin Moore. I pray their deaths will not be in vain. It is hard to find the right tone after the tragic events on 11 July 2017. Gavin Moore, a well-known member of North Down Cycling Club, died when a driver collided with him on the Ards to Bangor dual carriageway. My sympathies are with his partner and children. At the same time I feel anger. Anger that in the space of one year three cyclists have died on North Down roads. Two on the A21, one on the A2. I’m angry that these deaths will soon be forgotten about by all but the immediate family. It is for the authorities to establish how these three people died. And in June 2017 a cyclist was injured on the A21 at the Newtownards Road roundabout on Bangor’s ring road. What the these roads have in common is their near complete lack of designated cycle infrastructure. 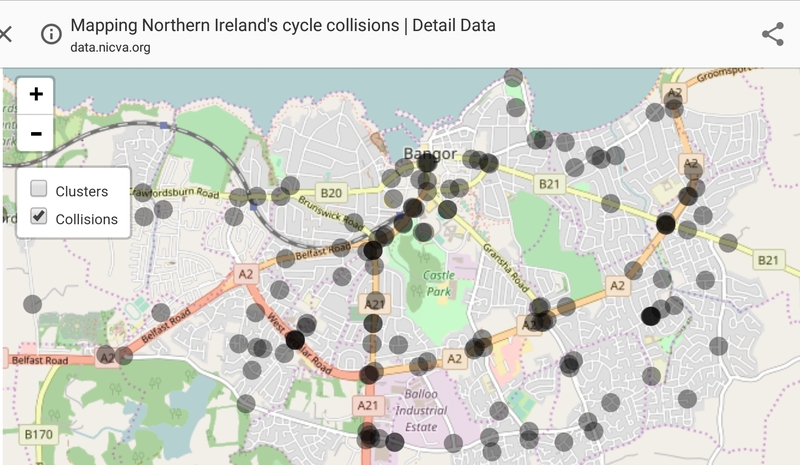 The number of collisions involving cyclists across Bangor is sobering. Each dot represents someone whose trip out on a bicycle took an unexpected and unwelcome turn. Most, thankfully, resulted not much more than a grazed knee, or a broken bike, however for some that collision left them with life-long changes. This kind of infrastructure is not going to enable 8 to 80 cycling, not even if the bicycle motifs and arrows are put the right way around. It is totally unacceptable to have cyclists share road space with fast motor traffic travelling at 50 to 70mph. At these speeds an error by any road user can have serious consequences. At such speeds a collision with a pedestrian or cyclist will always result in death or serious injury. It is nothing short of a miracle that some walked away physically uninjured from the collision on Tuesday, 11 July. Before the A21 dual carriageway was completed in 1976 Bangor to Newtownards traffic went through Conlig village. The old road is still there as the Old Bangor Road and Main Street. It only gives access to the village. Conlig has 2 buses an hour in each direction. Both motor vehicle access points from the bypass to Conlig have seen collisions with cyclists and are not safe. An alternative is needed. The old road begins here and ends here, separated from the bypass by fences, but allowing pedestrian access in both cases. Widening access and building a short stretch of cycle path would allow cyclists access to the old road from the bypass. The village main road currently has a 30mph speed limit, which is enforced by speed cushions. The presence of traffic calming suggests that speeding is an issue in the village. However, it is not a road with a high traffic volume. The village environment can be improved and cyclists’ lives be saved by changing Main Street to a cycle priority street. Overtaking is discouraged by including a cobbled centre median, forcing motorists to slow to cycling pace. The road itself only gives access to adjacent properties and through traffic is routed elsewhere. And the area is a 30km/h (20mph) zone. Another example is this “fietsstraat” in Lent, near Nijmegen, NL. It is also a bus route. A Cycle Priority Street cannot live in isolation. It is pointless to protect cyclists and at each end throw them in front of cars as bumper fodder. At the Bangor end a short bidirectional path would need to be be built to take cyclists to the cycle priority street beginning. But there is also the generously laid-out Rathgael Road and Newtownards Road roundabouts. Both need to have protection for cyclists added. This can be achieved within the footprint of the current roundabouts. And in Newtownards at the Donaghadee Road roundabout a similar pattern emerges. The A21’s generous lane widths, verges and median can be better used to provide designated cycle paths on either side of the road. The paths must be bidirectional to reduce the need for cyclists to cross the road. From Bangor the bidirectional path on the eastern side can be ended at the Green Road junction, allowing cycle access to the light industrial zone and government offices east of the A21. For onward travel the bicycle user can switch to the route through the village. In Newtownards there is less space available, so a road diet of reducing the northbound from 2 to 1 running lane may be necessary to accommodate safe space for cycling. At Conlig improvement can be made for the junction with Green Road. The best solution is to take pedestrians and cyclists over, or below, the main road into the village. The current arrangement of staggered pedestrian crossings and lights is not ideal. Until there is money found for a bridge or tunnel, the crossings will need to be adapted to allow bicycle users across the A21 and into Conlig village, via Green Lane. 3 fatal road traffic collisions involving cyclists, 2 at Conlig on the A21, should spur the authorities into action and make budget available to build infrastructure that will prevent more deaths in North Down. Conlig village Main Street and Old Bangor Road could become a cycle priority street, taking cyclists off the main A21 carriageway. Short stretches of bidirectional paths will need to be constructed to connect the cycle priority street to Bangor and Newtownards. On the eastern side a bidirectional path can be built between Bangor’s ring road and Green Road, to reduce the need for bicycle users to cross the main carriageway. The pedestrian crossing at the Green Road junction needs to improved. The three main roundabouts on the A21 need to see protected space for cycling.